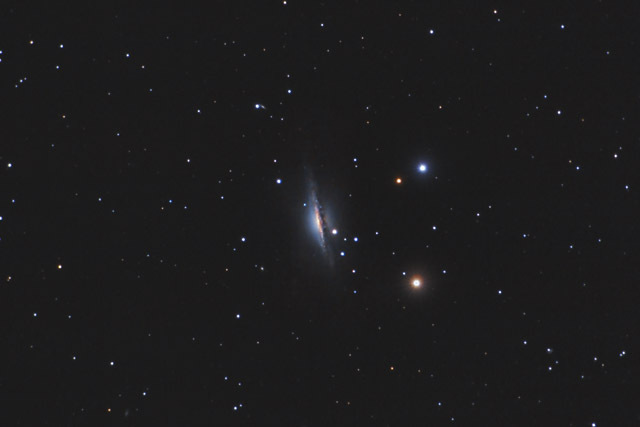 NGC 1055 is an edge on spiral galaxy located only half a degree from M77. 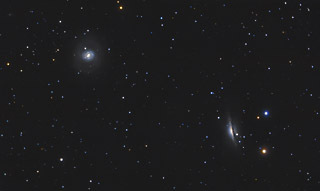 The two galaxies are the dominant galaxies in the small "M77" group of galaxies. NGC 1055 emits a large amount of radiation in the infrared and radio portions of the spectrum. Astronomers theorize that this is indicative of a high volume of star formation in the galaxy. Software Used Images Plus 4.5 for camera control, calibration, stacking, digital development, multiresolution sharpening, smoothing and noise reduction. Photoshop CS5 used for levels and curves, color correction, selective color, high pass filter, star shrinking, lab color, saturation adjustments, screen mask invert, lens correction, HDR toning and smart sharpen. Gradient Xterminator for gradient removal. Carboni Tools for additional saturation adjustments, noise reduction, and smoothing. HLVG for additional color correction. Registar for alignment of stacks. Notes This galaxy is much more subtle than its neighbor, M77. As a result, processing this image proved to be tricky, but I'm happy with thefinal image.